Incredible availability meant that we needed to source an additional Sunday fixture to the one already in the card against Kingstonian. Our friends from Whiteley Village had an ad on the board, and a call to them resulted in a second game being agreed meaning everyone who was available at the time got a chance to play. The earlier of the two games to start saw Stoke in the field after a lost toss. Drew Birch and Raja Singh each started with a maiden, but having had a look, 1s opener Khalid flexed his muscles and smashed 26 in the space of the next two overs to suggest it could a difficult day; but he was gone moments later when he skied one to mid-on and debutant Jonathan Pine took a great catch; the significance of this wicket not lost on the players after what he has done to our Sunday attacks this season and on other occasions on Sundays and in Saturday 1st XI League matches. Singh, (5-2-6-2), doubled his tally when he nipped one through Prabhu’s defences; but the run rate was healthy as the hosts continued to play their shots. Whilst they were initially successful, getting to 70 for 2, they then lost a succession of wickets to poor shots or failed execution of hittable deliveries. Patra guided a leg-side full-toss from Hamza Hafeez to Sameer Khara who took a great catch, (his first in senior cricket), at deep long leg, and the confidence he gained from this saw him bowl five overs that challenged the batsmen. After Hafeez, (4-1-18-3), picked up two more via a good slip catch from Peter Phipps and great grab by keeper Carel Ferreira, Khara Jnr got his reward when No.3 Venkat, the only player in the top eight to dig in, edged a lifting delivery and was caught at the wicket for 20. 70 for 2 became 85 for 6, then 85 for 7 when Saleem Ghuman bowled Lucas who hacked wildly across the line; this gave leg-spinner Pine the chance to run through his overs quickly at the tail and he can be very pleased with his contribution. Whilst Pine locked down an end, Ghuman took a second wicket – another good catch by Phipps – then he turned catcher with a good one-handed effort low down to give Moumer Khara the 9th. 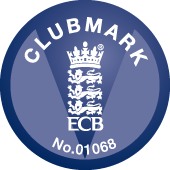 Pine closed the innings with the deserved wicket of Jacobs – a third catch for Phipps – so Stoke had 143 to win; very achievable with sensible batting rather than some of the kamikaze stuff seen in the first innings. The perfect combination was at the captain’s disposal. Phipps got himself in, Khara Snr waited for the bad ball and dealt with it appropriately, and an opening stand of 59 in 16 overs put Stoke in the pound seats. Khara, (39), extended his lead at the top of the Sunday XI runs aggregate with games running out, his progress cut short on 39 when he guided McEvoy’s delivery to Khalid. Ferreira hit a six and a four – and survived what would have been a silly run out – before being caught down the leg-side off Bradley’s first delivery for 13, (82 for 2), but Stoke knocked off the rest without further loss. No.4 and late call-up Aydin Huseyin defied injury and played as a batsman. He caressed a four through point to open his account and ran well with Phipps – very well on one occasion that saw an all-run five to a very long boundary – and an unbroken partnership of 61 completed an 8 wicket victory with plenty of overs to spare. Phipps had just enough runs left to make his first half-century of the season, walking off unbeaten on 51 from 92 balls with six fours. Huseyin registered a career best 29 red from 44 with four fours. A successful mission, and it was back to Whitely Village to catch the end of the other match. If an inter-club game between the two Stoke teams was played, this XI would probably have beaten the one that travelled to Kingstonian, and the security of having a few League players made the difference here. Stoke batted first against a short-handed home side and ticked over at 4+ per over from the start. Alastair McMillan, (16) and Malcolm Dickson, (28), got starts; Kevin Morgan was less fortunate to fall to a catch by Geoff Vinall, sub-fielding as Stoke skipper Earl kindly lent fielding resource. Earl helped himself to 45 with seven fours and two sixes; Teague Clarke – only able to play as a batsman due to a back injury – sadly failed to trouble the scorers before boarding school beckoned, and Rod Thomson should be checking his tyres to see whose cat he’s run over this week as he was run out courtesy of a pick up and direct hit from…sub fielder Jase Earl. Stoke already had 171 on the board to this point as Stephen Finch was in tremendous form, hitting twelve fours and two majestic sixes in his 85 not out, his highest score since August 1982, and only four shy of his career best against made against the Avorians in his first season for the Club in 1976. Will Thomson clubbed an beaten 24 in an unbroken 7th wicket stand of 60 to turn an already decent total into a formidable 231 for 6. Whiteley Village got a bit of a flyer as McMillan was, (allegedly), given the first over by Earl in return for waiving his fees; Perren and Shambler getting a nice start; but Duncan Elder, (7-3-11-2), Geoff Vinall, (5-0-17-4), and Rod, (1 for 17), tore through the top and middle order to effectively end the match as a contest. 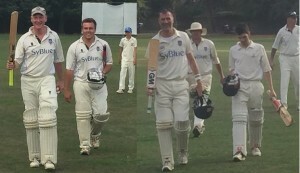 Whitely Village batted on, though, Rory Harris took out the innings’ top scorer – Malcolm Dickson taking his first outfield catch of the season – and Elder & Thomson Jnr completed a 122 run win in front of the players who returned from the other match to complete a great weekend for the Club. But it was President Finch’s day. Word reached his ecstatic brother who was unavailable due to domestic chores; it’s now 5935 with 21x50s versus 4589 with 17×40 so you need to get in the nets Jnr. We’ll see you both in a couple of weeks.